Artificial Intelligence is one of the most disruptive technologies that is reshaping the world around us so profoundly that it’s hard to tell what implications it might bring tomorrow. AI is perhaps the only technology which has made its effect felt across every technological domain, having its implications in every industry and every business. Enterprise Resource Planning or ERP is one such field where AI is starting to spread its influence and it’s just the beginning. In fact, the ERP industry is so vast that it would take years to get AI fully functional across all its subdomains. But better late than never, AI is definitely the next big transformation in the ERP industry that will possibly alter the way things work. With the advent of Artificial Intelligence, the ERP industry is going through rapid transformations, keeping pace with the latest trends in AI. Moving away from the monolithic systems, ERP is moving toward Intelligent ERP or i-ERP, an ultra-advanced AI-powered technology with staggering ramifications. 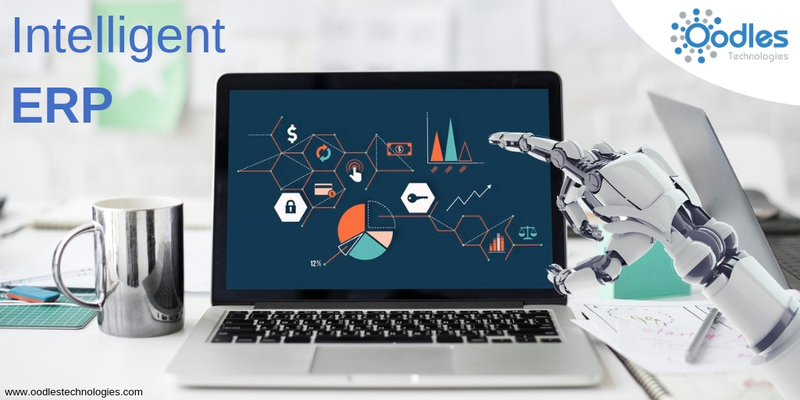 Surprisingly, while AI is the backbone of Intelligent ERP systems, it’s certainly not the only technology that combines with ERP to create i-ERP. It incorporates many other state-of-the-art technologies like Big Data, Machine Learning, Blockchain, Cloud Computing and Internet of Things (IoT). As a matter of fact, the age of Intelligent ERP has already arrived and it’s here. The ERP vendors like SAP and Microsoft are amongst the first few to invest in this transpiring technology. Lately, IDC FutureScape had made some important forecasts about the worldwide adoption of Intelligent ERP. As per the forecasts, more than 50% of the ERP based businesses are likely to introduce i-ERP in their business processes. You may also like How Blockchain Implementation In ERP Industry Can Change The Game. Artificial Intelligence is no doubt, at the front seat when it comes to the experiments going on with ERP. Not only that, AI is also playing a frontline role in enabling automation across the critical business processes. And when combined with Big Data, it can help utilize the insightful data obtained from various data sources in the best possible manner. Apart from that, AI will play a prominent role in predictive management of inventories. Pricing strategies and forecasting of achievable targets. Decision support in ERP will also pave way for embedded intelligence which will be yet another goal of businesses for their future ERP endeavors.